Sneezing is your body’s way of removing irritants from your nose or throat. A sneeze is an involuntary and powerful expulsion of air. Sneezing often happens suddenly and without warning. Another name for sneezing is sternutation. While this symptom can be quite annoying, it’s not usually the result of any serious health problem. What Causes You to Sneeze? Part of your nose’s job is to clean the air you breathe, making sure it’s free of dirt and bacteria particles. In most cases, your nose traps this dirt and bacteria in mucus. Your stomach then digests the mucus, which neutralizes any potentially harmful invaders. Sometimes, however, dirt and debris can enter your nose and irritate the sensitive mucous membranes inside your nose and throat. When these membranes become irritated, it causes you to sneeze. Sneezing can be triggered by allergens, viruses like the common cold or flu, nasal irritants, inhalation of corticosteroids through a nasal spray, or drug withdrawal. Allergies are an extremely common condition caused by your body’s response to foreign organisms. Under normal circumstances, your body’s immune system protects you from harmful invaders like disease-causing bacteria. If you have allergies, your body’s immune system identifies typically harmless organisms as threats. Allergies can cause you to sneeze when your body tries to expel these organisms. 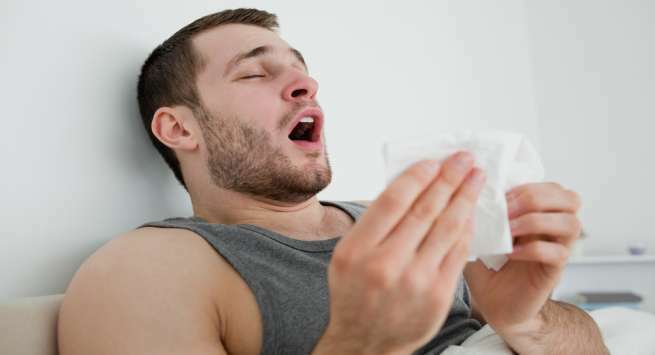 Infections caused by viruses such as the common cold and flu can also make you sneeze. There are more than 100 different viruses that can cause the common cold. Nasal sprays that have a corticosteroid in them reduce inflammation in your nasal passages and decrease the frequency of sneezing. People with allergies often use these sprays. 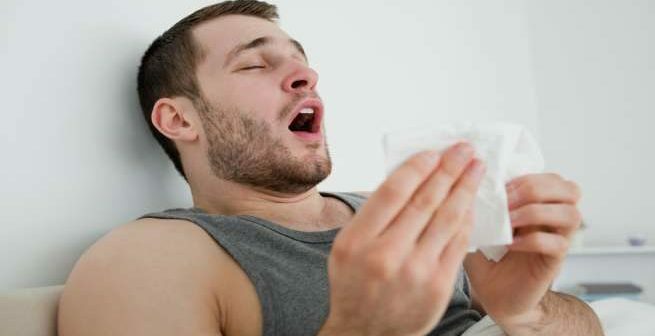 How to Treat Sneezing at Home? One of the best ways to keep from sneezing is to avoid things that trigger you to sneeze. You can also make some simple changes in your home to reduce irritants. Change the filters on your furnace to keep your home’s filtration system working properly. If you have pets that shed, you might consider cutting their hair or removing them from the home if their fur bothers you too much. You can kill dust mites on sheets and other linens by washing them in hot water, or water over 130 degrees F. You might also decide to purchase an air filtration machine to clean the air in your home. In extreme cases, you may need to get your home checked for mold spores, which may be causing your sneezing. If mold infests your home, you may need to move. If your sneezing is a result of allergies or an infection, you and your doctor can work together to treat the cause and resolve your sneezing. If an allergy is the cause of your sneezing, your first step will be to avoid known allergens. Your doctor will teach you how to recognize these allergens, so you’ll know to stay away from them. Over-the-counter and prescription medications are also available to relieve your symptoms. If you have severe allergies, your doctor might recommend that you receive allergy shots. Allergy shots contain the extracts of purified allergens. Exposing your body to allergens in small, regulated doses helps keep your body from reacting to allergens in the future. If you have an infection, such as the common cold or flu, your treatment options are more limited. Currently, no antibiotic is effective in treating the viruses that cause colds and the flu. You can use a nasal spray to relieve a congested or runny nose, or you can take an antiviral medication to speed up your recovery time if you have the flu. You should get plenty of rest and drink lots of fluids to help your body recover faster.